Legal malpractice is a very serious charge, and not one to be taken lightly. The outcome will affect you for the remainder of your life. If you have suffered loss because of your own attorney's negligence, we are dedicated to pursuing your case to its just end and securing your best outcome. WV Legal Malpractice Attorneys at Robinette Legal Group PLLC, Morgantown understand the keys to success: hard work, attention to detail, and focused commitment to the success of every single case. 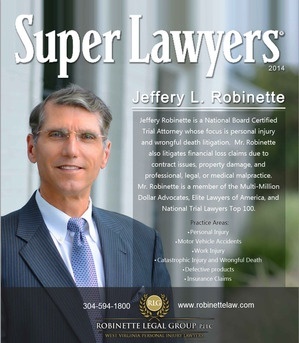 "Mr. Jeff Robinette brought our situation to a most successful conclusion. We could not have had an attorney to represent us in a more professional, helpful, caring manner." Mr. J. Under West Virginia law, legal malpractice occurs when a lawyer fails to exercise the knowledge, skill, and ability ordinarily possessed and exercised by fellow members of the legal profession in similar circumstances. In other words, a lawyer must provide professional services to the client of a quality no less than that practiced by his fellow lawyers. Just because a lawyer fails to perform a duty owing to a client does not mean that the client automatically has a valid legal malpractice claim. An attorney-client relationship requires a high degree of trust and responsibility. Lawyers have a legal duty to keep their clients advised of progress in their case and to protect their client's rights. In a breach in the standard of care, legal malpractice may occur when an attorney's negligent action, inaction (failing to file a lawsuit within the statute of limitations period), or advice causes the client damages through the mishandling of a case. Legal Malpractice occurs when a lawyer has failed to file a claim within the statute of limitations or failed to assert a claim that was available. Negligence in legal matters can also occur when a contract or will is not properly crafted. We have the experience to demonstrate when personal injury practice standards were not met and to help prove that you would have received a better outcome had your attorney not neglected some critical aspect of handling your claim. What makes legal malpractice so complex is that it is really a case within a case. Not only does it need to be proved that your former attorney made a mistake, but also that you had a valid claim and should have won your case and received compensation in the underlying case. Because of this complexity, it is imperative that you retain an attorney who not only has experience in successfully representing clients for legal malpractice claims, but also has decades of experience in handing complex personal injury, contract, and medical malpractice claims. “Reasonable communication between the lawyer and the client is necessary for the client to effectively participate in the representation. Even when a client delegates authority to the lawyer, the client should be kept advised of the status of the matter." 3) That the client suffered damages as result of the negligence. Is There a Time Limit for Filing a Legal Malpractice Claim? Do I Have a Legal Malpractice Claim Against My Lawyer? How do I find a Legal Malpractice Lawyer in WV? How Can I Afford to Pay a Legal Malpractice Lawyer? To learn more, click on the FAQ answers at the bottom of this page. We take attorney legal malpractice cases seriously. Attorney and law firm malpractice cases are complex and challenging, and our firm is one of only a few in the state that has a record of success in handling them. We have a commitment to hold fellow attorneys accountable when their negligence or wrongful action harms clients. Negligence: If basic tasks were not completed or deadlines for filings were missed, we can demonstrate how this neglect harmed your case. Failure to Obtain Consent: If a settlement agreement was reached without your consent, the law has been violated and your rights have been trampled. Your former attorney must be able to produce evidence demonstrating that you agreed to the settlement amount. If you feel that you have suffered a loss due to a former attorney's negligent or wrongful conduct, please contact the Robinette Legal Group PLLC for a free initial consultation. Attorney Jeff Robinette is also a legal settlement mediator for West Virginia and our Ridgeview Center is host to the Morgantown Mediation Center for Settlement Conferences and Alternative Dispute Resolution. Robinette Legal Group was a recipient of the Litigator Award For Personal Injury and Medical Malpractice, an honor which is reserved for the top 1% of law firms nationwide. [fa icon="plus-square"] Do All Lawyers Have Malpractice Insurance? Quick Answer: No, many lawyers do not have legal malpractice insurance coverage. Explanation: Legal malpractice insurance can be very expensive for a lawyer, or for a law firm. Established law firms of dozens of lawyers have ample legal malpractice insurance to cover any mistakes they make; however, these big law firms generally do not represent personal injury clients. Thus, the lawyers and law firms that represent personal injury clients normally are smaller law firms comprised of one to several lawyers. If the lawyer or small law firm is a professional limited liability company, or "PLLC" as it is designated on the law firm advertising, then state law mandates that the lawyer or law firm carry a minimum of one million dollars in liability coverage for legal mistakes. Unfortunately, many lawyers and small law firms are not limited liability companies and don't have any malpractice coverage. Often the lawyer or law firm that commits legal malpractice does not have either insurance or the personal assets to pay for the damages they have caused. A Word of Caution: Only a qualified legal malpractice lawyer can discern the value of your case and the ability of a lawyer or law firm to resolve the case. [fa icon="plus-square"] Is There a Time Limit for Filing a Legal Malpractice Claim? What is the statute of limitations for legal malpractice claims in West Virginia? Quick Answer: There are potentially three statute of limitations periods applicable to legal malpractice claims -- two-year, five-year and ten-year limitations period. Explanation: Because the practice of law is complicated, it naturally follows that claims against lawyers is likewise complicated. The reason there are three different statute of limitations periods for legal malpractice claims is because the law recognizes a distinction between a written contract for legal services, an oral contract for legal services, and common law (non-statutory) rights to recover for damages caused by negligent conduct. The law provides the greatest period of recovery for contract claims -- 10 years for written contract and 5 years for oral contracts -- but there are some limitations on rights of recovery. The shortest statute of limitations period is assigned to negligence claims against lawyers -- such claims must be brought within two years of the negligent conduct. The best combination of claims against a negligent lawyer is both a negligent claim and a breach of contract claim, which means that such claims must be brought within the two-year statute of limitations period. A Word of Caution: If your attorney has committed a serious act of legal malpractice -- such as failing to file a complaint -- then you should promptly contact a legal malpractice lawyer to ensure that you have every opportunity to resolve the claim before your claim is also time-barred. [fa icon="plus-square"] What payment options are available? Quick Answer: Most legal malpractice cases are handled on a contingency fee basis, meaning you don't pay until you are compensated for your claim. Some cases, however, are best handled on an hourly rate basis. Before you decide how to proceed with your legal malpractice case, discuss the payment plan that will work best for you. A Word of Caution: Delaying discussing your legal malpractice matter with a competent legal malpractice lawyer may make your case more difficult to prove, which could result in a higher legal fee or even preclude representation. Do not delay contacting a legal malpractice lawyer regarding your legal problems. [fa icon="plus-square"] How do I find a Legal Malpractice Lawyer? The best way to locate a legal malpractice lawyer is to search the internet for a Board Certified Legal Malpractice Lawyer. Explanation: There are thousands of lawyers who practice law in West Virginia, and each year there are undoubtedly hundreds of incidents of legal malpractice. When a lawyer commits legal malpractice, he will have no problem whatsoever obtaining legal representation to defend himself from a legal malpractice claim. Conversely, there are very few qualified lawyers who will represent an injured client. In many instances, the lawyer is successful in avoiding any legal malpractice claim, thanks in no small part to the fact that his fellow lawyers "freeze out" the injured client by refusing representation --- even though they know the claim is valid! At Robinette Legal Group we believe in the axiom "Justice For All" and that includes injured clients. A Word of Caution: There are some inexperienced lawyers who advertise that they practice in the area of legal malpractice. Check their credentials before you call --- often these lawyers are no better qualified to handle your legal malpractice claim than your first lawyers who committed legal malpractice. It is wise to look for a qualified legal malpractice lawyer who is board certified, and has the highest credentials in their field, such as inclusion as a Preeminent Lawyer AV Rating from the nation's oldest and leading lawyer rating service, Martindale-Hubbell, and other notable achievements such as inclusion as a Super Lawyer and Multi-Million Dollar Advocate. [fa icon="plus-square"] Do I Have a Valid Legal Malpractice Claim Against My Lawyer? Quick Answer: Assessing a potential legal malpractice claim involves both ethical standards and professional standards of practice. Only an evaluation from a qualified legal malpractice lawyer can advise on the validity of a legal malpractice claim. A qualified legal malpractice lawyer should be consulted promptly when a client learns of a legal mistake on their case. [fa icon="plus-square"] What is Legal Malpractice? 3) that the client suffered damages as result of the negligence. Damages are not presumed, even though the negligence was obvious. If the lawyer's negligence was pertaining to a curable procedural issue, then there would be no appreciable damages to the client. However, if the lawyer's negligence caused the dismissal of a client's claim, then the client would have to prove that the original claim was valid and establish the value of such claim. Proving a claim of legal malpractice is the subject of another video presentation. A Word of Caution: Don't delay discussing your concerns with a qualified legal malpractice lawyer --- there are time limitations on pursuing a recovery for your losses. Learn More About "What is Legal Malpractice?" Robinette Legal Group PLLC represents clients in West Virginia, including Bridgeport, Buckhannon, Clarksburg, Elkins, Fairmont, Grafton, Kingwood, Morgantown, Star City, Wheeling, and all communities of Barbour County, Braxton County, Calhoun County, Doddridge County, Gilmer County, Harrison County, Lewis County, Marion County, Preston County, Randolph County, Taylor County, Tucker County, Upshur County and Wood County. We represent clients for legal malpractice claims for those who have been injured in car accidents, truck accidents, wrongful death, brain and spinal cord injuries, and serious catastrophic injuries or have suffered from medical malpractice or breach of contract. Call Jeff Robinette at Robinette Legal Group PLLC at (304) 594.1800 or after hours (304) 216-6695 for a free consultation.